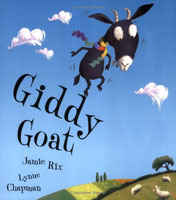 This is the sequel to Giddy Goat, in which Giddy Goat wants to be the greatest climber in the world. But one day he has to make a choice…winning the Giant Pinnacle Race or winning back his best friend. What is a goat to do? Being a mountain goat is no fun when you are scared of heights! An action-packed story of facing fears and making friends. When Maurice’s mother tells him not to take the last chocolate biscuit until he’s offered it to everyone else, he does exactly as he’s told. He offers it to absolutely everyone. He even offers it to a space monster – and that’s when the real fun begins! 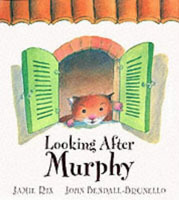 Granny Lally is looking after Murphy the hamster. Granny promises not to take her eyes off him, but looking after Murphy is a full-time job and something is bound to go wrong. A witty tale about every adult’s worst fear; the lost pet! Alistair McAlistair loves his Free The Whales T-shirt, He wears it all day and every day – until it starts to smell…and smell! But he won’t let his mother wash it. Whales can’t roam free in a washing machine, he says. The whales, though, have other ideas! All over town it’s boiling hot. At the zoo, the animals are dying for some ice cream. The warthogs are wilting, the parrots are parched and the snakes are sweating. And sitting beside a dried up pool is Whistler! When a small boy with large pockets visits the zoo, Whistler spots his chance to escape to a colder climate. 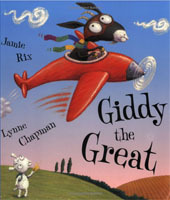 Short-listed for the Roald Dahl Funny Prize 2010! Alfie Pluck is the unluckiest boy alive… that is until he eats the chicken containing the highly sought-after luck gene. Now no end of people want him for their own devious deeds and crackpot schemes, because, let’s face it, everyone needs a bit of luck. The only trouble is that to get the luck gene out of Alfie, someone has to eat his brain. Who will get to feast first? The Prime Minister, who wants him to help her win the election; Fox and his thieving tribe, who want him to rob a few banks and make their fortune; his cruel aunts want him to find them a husband each; or Dr Shard, the scientist who invented the luck gene and stood to profit from its sale around the world before Alfie stole it? The chase is on, and Alfie quickly discovers that being the luckiest boy in the world is not lucky at all. OK people, listen up. Father Christmas has hung up his boots and retired to bed. From now on Christmas will be run by me, his badass daughter, Lara, over the internet web super information highway. Come to fatherchristmas.com for all your one-stop stocking shopping needs! Simply click here to choose from our wide range of six toys. BUY NOW while stocks last! Never before has Christmas been so cheap! Everyone knows to fight fire with fire, but how do you fight a fire demon? 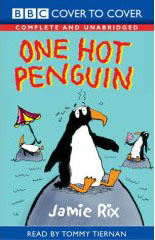 When Henry Hooter’s parents are killed in a freak accident at the Light Fantastic Firework Factory, eleven-year-old Henry is left alone with some burning questions. Like why is the fiery-tempered new owner of the factory so interested in the Howling Hullabaloo Howitzer, the last rocket invented by Henry’s parents? Where have the town’s children started disappearing to? And are there really such things as dragons and fire lakes? As the answers emerge and the sparks begin to fly, Henry wonders whether he’s got himself involved in something that’s just too hot to handle. The Cool Guide is a unique scientifically researched laboratory proven foolproof programme designed specifically to pull girls. If you want to think cool, walk cool, talk cool, BE cool – in short, if you want to have the honeys hanging off you, this is the book for you. From tackling tongue sushi to how to get busy with Lizzie, find out how to become cooler than cool in just sixteen and a half steps. These titles have gone out of print, but don’t worry. You can still buy the books online and your local library will definitely have copies. The nation’s youth is under attack! Children everywhere are falling prey to the Dreaded Lurgie, an evil epidemic with sinister symptoms. It’s horrible, but it’s happening…the Dreaded Lurgie makes you old! Frank and Arthur know that something must be done. They are also convinced that the spread of the Lurgie is down to witchy Ma McCracken, infamous child-hater and their next-door neighbour. An antidote must be found to both these blights, or the nation’s playgrounds will lie deserted… forever. Time is running out for Augustus Stitch. Born on the 29th February, his birthday falls once every four years. While his friends live to be eighty, Augustus will die at the tender age of twenty. Desperate to deny death, Augustus decides to make himself immortal. Old Father Time warns him not to meddle – time waits for no man, not even Augustus Stitch. Or does it? Will Augustus ignore this crazy old man who lives in a cuckoo clock in the sky? Will he really be the first boy in the world to live forever? Princess Viola is the grumpiest, nastiest princess ever. In fact, everyone calls her Princess Vile she’s so horrid. But Princess Vile has the most beautiful smile that puts everyone under her spell. Prince Moneybags is so dazzled by her smile he asks her to marry him. But then the princess loses her smile. The kingdom is put on alert. The smile must be found, or no one will marry Princess Vile!